Increasingly, the Coalition parties view the 2019 election as Napoleon’s retreating armies viewed the retreat from Russia: likely ignominious defeats on the move were still better than the certainty of dying from a stationary exposure. Unlike Napoleon’s army, though, there are too few knapsacks left among the Liberal infanterie which could still hide a baton. Indeed, the old guard and chasseurs have long since departed. Like Napoleon’s invasion of Russia, the Coalition’s six years in government have been, simply, a disaster for its purported cause. We are now at the battle of Leipzig stage, with a fatal retreat to the Paris of the Opposition benches not far off, either. 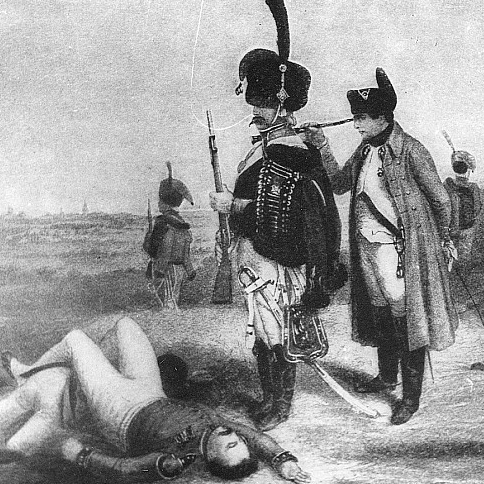 Battle of Leipzig, by Ernst Strasberger: The day after the battle. I wrote here in 2016 and 2018 about Australian conservatism’s history and its way forward, even if its partisans now stand among its ruins. However, these pieces were written before August’s mendacious and ruinous toppling of former Prime Minister Malcolm Turnbull. It is as if the Coalition decided to imitate the worst of the Rudd-Gillard-Rudd era, but, unlike that justly criticised Labor era, the Coalition did nothing to make the conservative faithful grateful that they had ever marched on the Moscow on the Molonglo. It remains unclear, almost 100 days later, quite why Malcolm Turnbull was toppled. To this day, the leading plotters have not been able to explain any motive for Turnbull’s removal other than those ones that do not need any explanation, such as ego and ambition, best subtitled as ‘the hack’s progress’. That Malcolm Turnbull was, in fact, a very good Prime Minister, in terms of running a cabinet government and being on top of his brief, on the whole range of matters facing a Prime Minister in 2018, was neither here nor there. Malcolm Turnbull had, apparently, ‘lost the base’—despite enjoying polling that the current Coalition partyroom would, no doubt, kill for (in some cases, I suspect, literally, given how many Coalition MPs have no other career to fall back on). Since Turnbull’s fall, seemingly everyone loosely associated with ‘the Right’ has piled on to explain how his competitive electoral position had become, with the coup led by the assassins of ‘the base’, nothing short of calamitous. Meanwhile, post-coup, the seat of Wentworth was lost, something no previous conservative party had managed to do. While Wentworth’s concerns are hardly representative of middle Australia, the fact that the seat had been held by the Right of politics since Federation, through wars and depressions, and was now lost, is an augury no sensible person ignores. Then came the disastrous Victorian state election. Who knows what 2019 will bring, albeit a NSW Coalition government not exactly renowned for competence may be saved by Labor’s scandals? As Zhou Enlai commented to Henry Kissinger of the French Revolution’s effects, ‘It is too early to tell’. The recent sight of Julie Bishop—who was the Liberal deputy leader for 11 years and intimately involved in the rise and fall of every Liberal leader since Brendan Nelson—trying to play the role of a blue-ribbon martyr is a sure sign that no one has learned anything. What is able to be told now, though, because it is plainly obvious, is that the conservative cause has been, increasingly, ill-served by the political vehicles that it has, hitherto, relied on since, at least, the 1940s. The Liberals, simply, have no idea what they stand for in 2018. The alternatives are as bad if not worse. The Liberals are populated, from Scott Morrison on down, by people who have been in politics and its games for too much of their adult life. A party formed to be the champion of Menzies’ forgotten people has become, instead, the champion of their tormentors. No reasonable observer would deny that Tony Abbott was part of the problem and bears much of the blame for the Liberals’ collapse. However, someone like a Tim Wilson or a Kelly O’Dwyer, as well as the other cloned drones who have been political apparatchiks, should not escape censure either. While O’Dwyer may say the problem is the party’s image with Toorak’s decisive puffer jacket demographic, she represents, as do so many contemporary MPs and Senators, the Liberals’ fundamental problem. It was O’Dwyer who fought and only reluctantly capitulated to what is now the obviously needed Hayne royal commission. Similarly, it was O’Dwyer who called cuts to penalty rates an ‘adjustment’. It was these MPs who have done little to advance genuinely family and fertility friendly policies in workplaces that accommodate working parents. For the modern Liberals, the real ‘forgotten people’ seem to be the bank CEOs and directors now lining up to take their place in various witness boxes. Contra the parties that elected former leaders as different as Lyons, Menzies, and Gorton, the Coalition partyroom is now all too full of bland, ‘on-message’, ideologues, untempered by any experience outside politics, trying to compress their pet Hayekian theory into a three year federal electoral cycle. One suspects they will soon have their own experience of creative destruction at the hands of the voters, and an opportunity to test their own ‘market values’. Hopefully they can explain their recent antics to their next employers better than they have explained them to their current employers, the Australian people. The other conservative alternatives, such as the Nationals, are engaged in fighting their own civil war and, from what one can gather, the Bernardi party is too busy creating a French cuff version of One Nation. To continue the Napoleonic theme, one does not know if these are Bourbons who have learned nothing or they are mere obscurantists. The most pressing major problem that faces the Liberals is that they have nothing to say to anyone who is not, already, part of ‘the base’. In particular, the Liberals have nothing to say to most Australians under 40, who are, all too often, mired in debt, have insecure work, and have no realistic prospect of owning any kind of home of their own This is not just wrong but, as I have said for some years now, there is no future for conservative politics unless everyone has some share of prosperity and something of their own to ‘conserve’. A future of insecure work to pay the rent is a recipe for a left or even socialist electoral hegemony, as happens in most large cities, where revenge is best had at the ballot box. You can be as gay-friendly or ‘quotas for women on boards’ as you want, politically-speaking, but none of these window-dressings will prevent an electoral drubbing owed when too many people feel left out and are given no realistic reason to believe you will help them improve their lives. And in the next election, one suspects the forgotten people will not forget who helped to bayonet the wounded. The successful political conservatives throughout the history of the Anglosphere got this, which is why, in the British context, the Tories prior to the Great War broke with the liberals to oppose free trade and to support the trade unions. It is why Lincoln did not just oppose slavery but started the land grant colleges to give practical training to working and rural populations coping with the industrial revolution. It is why Pope Leo XIII, the scourge of 19th century socialism, also wrote Rerum Novarum. Holding the realm together, emphasising that we are all in this together, and helping everyone, as near as possible, to have some decent stake in the nation—and not be left at the mercy of the state or the cartel—is what conservatives should be doing if they do, indeed, ‘keep the faith’. Instead, the Liberals, who are happy to take conservative votes and mouth conservative propositions, have been running a protection racket for the worst forms of vulture capitalism. Conservatives do not worship the market but, rather, see the power of the state as a means of keeping society on a sound and even keel, as well as to right wrongs. There is nothing conservative about supporting cuts to penalty rates, nor opposing legislation that benefits families, nor opposing the quite reasonable demands for a federal probity commission. There is no future for a politics of serving mammon and enabling the scandal of public corruption. The other major problem faced by the political Right is the public idiocy of so many of their more prominent personages on the matter of immigration. Australia has had and will, on any view, continue to require a large-scale immigration program. No serious person, looking at Australia’s demographics, as well as its future economic and security needs, would disagree with a large legal immigration and refugee resettlement program. A ‘big Australia’ is in the national interest. That the several states, especially New South Wales, are, frankly, abysmal at building infrastructure, is not a meritorious argument against immigration. More importantly, Australia has been a remarkably successful and harmonious, pluralist, society. We have received and absorbed huge numbers of immigrants and refugees, the overwhelming percentage of whom are enormously happy and thankful to be here. That was the story of all of our ancestors at one stage. It is churlish and unseemly to denigrate the value we Australians derive from immigration and the compliment that migrants pay to Australia in wanting to come and settle here with us. That the party of Menzies and Fraser—two very conservative Prime Ministers when in office—could suddenly want to seek a smaller future for so large a country as we are is, I think, appalling. Moreover, when one thinks of the traditional conservative values of so many migrants here, especially as reflected in the values of hard work and family, and even in the postal ballot last year, the degree of political self-harm done by this attempt to whistle at dogs growling in the ‘Sky after dark’ green room is incalculable. It is as if the Liberals have decided to trash the prudent, mature, sensible, realistic (if, admittedly, not altogether exciting) persona, of the conservative generations past to, now, suddenly seek to have their own ‘killing season’, except that it is a political mass seppaku. Finally, as the descendant of Tories, both literal and political, one finds it hard to look at this period in Australian politics with other than the deepest foreboding. On both sides of the national parliament, we have MPs and senators who have done nothing else with their lives except plot, scheme, and manoeuvre, for their own advancement and those of others, also, lacking in merit. We are a nation now inured to leadership ‘coups’, ‘the numbers’, ‘the faceless men’, and the Delphic interpretations of the wishes of ‘the base’. It was one thing for this to occur on the Labor side: they were another party and another culture, with factions and powerbrokers, and born of the unions. That this virus of hackery, and its endemic scheming and lies, has now infected our conservative side is a matter that should cause disquiet to every sound Australian. One can deride the old guard of conservatism, its culture and mores, its clubs and its prejudices but, at the end of the day, its adherents were never in public service for a career, or filthy lucre, and when they engaged in politics, it was to defend old principles—ideas that one would, decades later, still hold to and be proud of having defended. Where Menzies left the prime ministership in a form of penury to then teach and write his memoirs, his parliamentary successors now go on to swampish rewards as ‘consultants’, ‘commentators’, and ‘government relations introducers’. The old guard would see this as the stuff of self-interested vulgarians—and they would be right. O God, grant us in our deliberations that we may see clearly, speak with truth, and act with courage and justice, so that in all our works Thy will be done. Colonel Honner’s life of duty, like his prayer, offers an alternative way back for a political Right that is now lost. It is narrow path but it is a true path. It is a noble path. And it is one which, when followed, will not only improve Australia but may, even help redeem our politics. We who are conservatives should hope for, and demand, no less.